The Finn and Fram Dual-Wire-Mesh-Belt Compaction Module is a powerful yet gentle means to wet out the SMC material with compressive and shear forces. 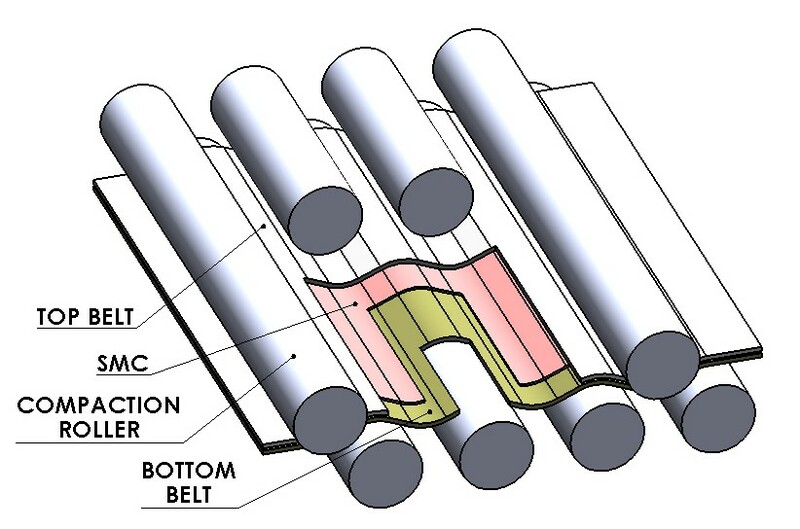 The SMC is conveyed through the compactor by wire-mesh belts above and below. 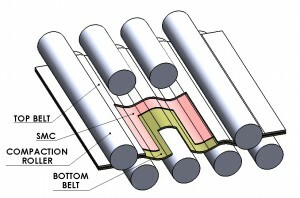 Heavy steel rollers underneath, suspended from four large air bags, push the belts and SMC up against staggered heavy steel rollers above forcing the SMC to follow a wavy path. The top surface thus alternates going over a larger then smaller radius than that of the bottom surface working the material inside back and forth as it is compressed. The result is a uniform high quality product even with high glass content, very viscous paste, and high-speed operation. Heavy construction for uniform processing and dependable operation. Automatic belt guiding with alarm. Stable, fully adjustable serpentine path and ramped processing pressure.